Wilma and Andy Morrison had considered painting or replacing the peeling, curling siding on their Mansfield, MA, home for about three years. Finally, Wilma started researching the cost of installing new siding that would look like their Cedar Shingle siding. Once Andy got on board with the project, the couple decided that they wanted siding that would give the home a fresh look and withstand the harsh local weather. They ultimately selected Mastic Carvedwood Vinyl Siding, which requires minimal maintenance and matched the color and grain of the old siding. Andy and Wilma accepted bids from five contractors, including Jancon Exteriors and two other Angie’s List contractors. Our owner met with the couple to thoroughly discuss project details, anticipated costs and our qualifications. Although some contractors offered lower bids, Andrew and Wilma selected Jancon Exteriors based on our honest approach and our positive client reviews. When we removed the old siding, we found sheetrock, which can’t securely support vinyl siding. We also discovered that the house lacked insulation between the inside and outside walls. We proposed that we remove the sheetrock, add insulation and install plywood sheathing before proceeding with the project. We also suggested the installation of gutters with leaf guards to alleviate issues with ice damming. The couple accepted both proposals, and from then on, the project went smoothly. Andrew and Wilma loved our quality work and our willingness to accommodate their schedules. When we experienced delays because the couple was waiting on a door installation, we handled the installation ourselves. When we learned that the door wasn’t sized correctly, we reframed the door opening at minimal cost. The couple was impressed that the electrician we referred kept the project moving on schedule despite inclement weather. They were also pleasantly surprised when we used extra siding to fashion a sunburst over the front door, further beautifying the house at no additional cost. The couple expressed excitement about the new look of their home and the improved energy efficiency that they will enjoy for years. 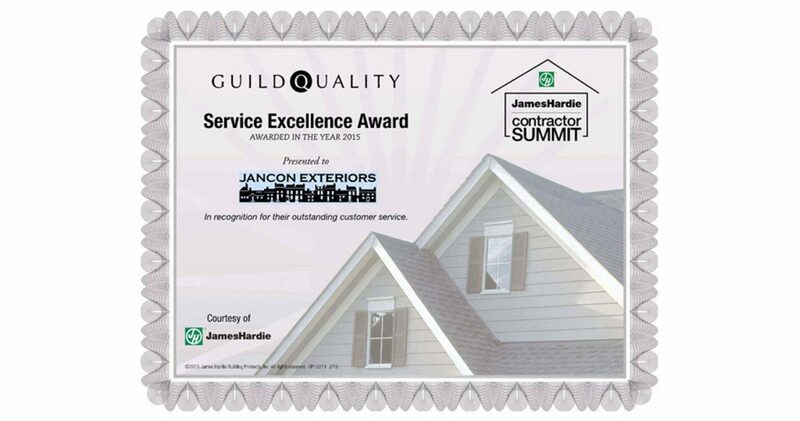 Jancon Exteriors specializes in roofing, window replacement, siding installation and other home improvements, which are all backed by leading warranties and quality guarantees.